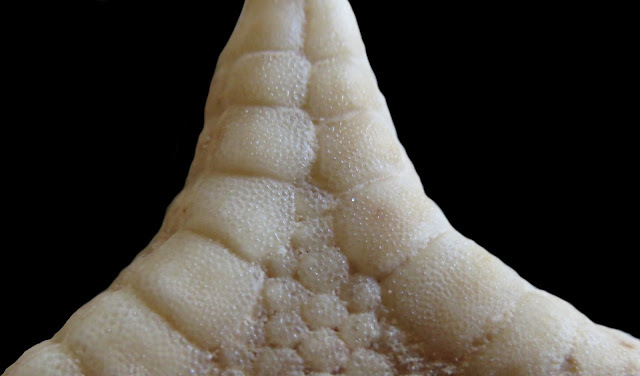 The Echinoblog: Five Highlights from my NEW paper about the genus Ferdina and its relatives! Five Highlights from my NEW paper about the genus Ferdina and its relatives! GREETINGS! Last week, a new paper I've literally been working on since I finished my PhD has FINALLY been completed! Its easily my largest monograph at the moment and includes a whopping 14 new species, 3 new genera and a new subfamily! For those who are interested, it was in the latest issue of Zootaxa, published online here (I don't believe the print version is out yet). 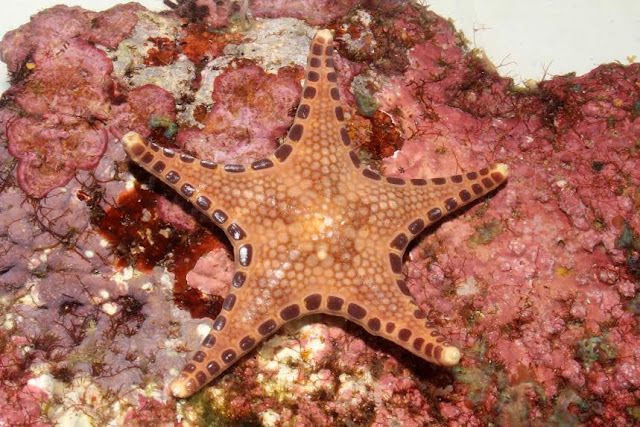 The paper focuses on a group of tropical shallow/deep goniasterid sea stars which include reef setting genera such as Neoferdina but also seldom studied genera such as Ferdina and their relatives. I actually ended up describing 3 additional new genera and MANY new species! Its always nice when the work is done and the specimens can go back to their home institutions.. many of these specimens were from the echinoderm collections at the Museum national d'Historie naturelle! The whole thing is a lot to unpack.. and so here's some take away lessons that I thought I would share from writing it! 1. Citizen Science & Social Media Made a Significant Contribution! I've talked about this before.. the world is flooded with divers, photographers and interested people with cell phones all over the world! Thanks to a combination of museum collections and divers I was able to identify and describe several new species and even add color variation to poorly known species in the group I published on! Many times these get misidentified as people try to "shoehorn" them into known species in field guides. I will likely do a separate post on the etymology of these new species a bit later, but the species epithet of this one "oni" represents a horned demon from Japan which alludes to the two spines on each plate along the side! 2. The Mesophotic Zone: New studies and new Species! There's a depth region in the ocean that falls just below "coral reef" (~30m) depth but just above the "deep sea" (above 200m).. that's roughly between 100 and 500 feet. More about this area here. and this entire website devoted to this area! This area is also known as the "Twilight Zone" aka the "sub Reef area" and contains a fauna that is related and similar but distinctly different from those seen at the surface. The California Academy of Sciences's research division as well as their Steinhart Aquarium have both been studying this area in the Philippines. In 2015, they collected this lovely beast, (and here was a news account showing it off) which I had also been observing in the Paris collections from areas throughout the Indo-Pacific! I initially identified it as a familiar genus, Neoferdina, but eventually realized it was actually a separate and undescribed genus which I named Bathyferdina! One important take away message: Describing new species is PART of understanding the biology of a NEW ecosystem. 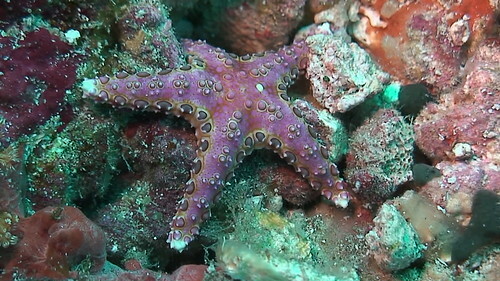 This was the same thing that happened with understanding all of those predatory coral starfish.. new species led to understanding each "character" of a new ecosystem! Here's a neat new species from the western Indian Ocean-Madagascar and the east coast of South Africa.. Ferdina mena! Identified by the two distinctive bald patches present in each interradius (i.e. 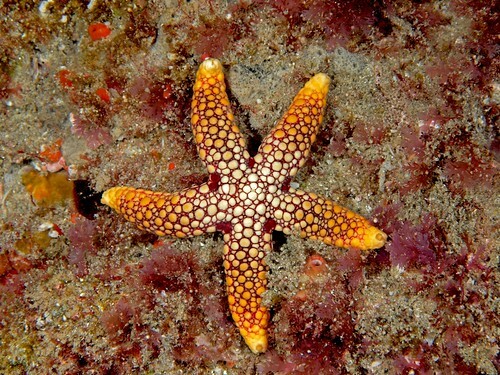 the "armpit") of the starfish. Thanks to the stunning photos of "Optical Allusion" I was even able to find living images of this species in South Africa! I have a strangely long history with this species.. I identified one of these (mistakenly) for the field guide Coral Reef Animals of the Indo-Pacific by Terry Gosliner, Gary Williams, and Dave Behrens- as Ferdina sadhensis which was known only from Oman. During one of my recent visits to Paris and the Museum national d'HIstorie naturelle in Paris, I discovered that this wasn't just an odd specimen with the twin bald, red spots in each interradius..it was present on ALL of the specimens collected from a collection made from Madagascar!! Following this, I was visiting the Iziko Museum in South Africa in 2015 and discovered the SAME species from the east coast of South Africa! 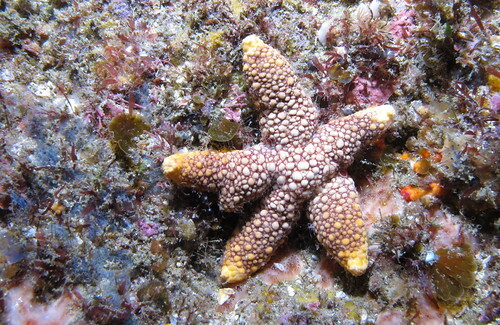 Citizen scientists in South Africa also showed me MANY photos of starfishes which confirmed the specimens. and to return to the citizen science angle.. images on Flickr further showed this species in Mozambique as well as further color and pattern variation of this species from South Africa thanks to photographer Derek Keats and others! In both cases, these specimens had been collected and sitting in these museums awaiting discover for YEARS. In Paris-2007 and 2010 and from the Iziko Museum collections-in 1986!!! So, somewhere in there, this seems to be consistent with the "21 years" which malacologist Dr. Philippe Bouchet has published as the average time it takes for a specimen to get from collection to publication! This was an interesting lesson. For one of the new species I had discovered, Paraferdina plakos, I only had one or two individuals on which to base my new species description. Were they the same? Was it variation? How do different individuals differ from one another? Are the defining characters the same across the species range? I was actually able to make OVER TWENTY OBSERVATIONS of this species misidentified as the common "peppermint star" Fromia monilis!! This led to ANECDOTAL information about its color and how individuals varied in shape. One or two sites actually were pretty up front about declaring how their specimens had been collected from Sri Lanka, suggesting a further occurrence point for this species. What does this tell us? Not ONLY are A LOT of new species yet to be discovered but we are ALREADY seeing them sold in the pet trade.. and with no correct identifications by scientists to recognize them, are they endangered? For a species that has just been described we know NOTHING bout its reproductive biology, populations, can they handle the strain of being "fished" for this trade??? 5. Mysterious Crystalline Nodules! MicroLenses? or just developing granules? On several of the species of starfish I've worked on, close examination of the surface revealed that there were HUNDREDS of these glassy crystalline nodules embedded on the surface of the skeleton! 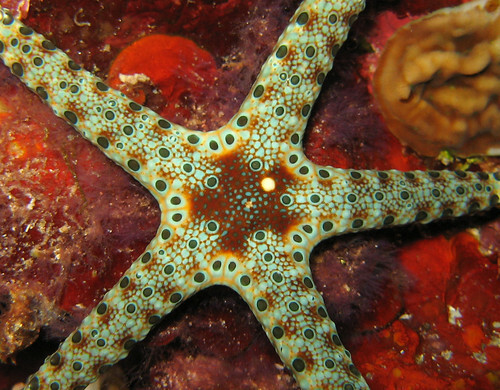 These have been used as a taxonomic character in sea stars for well over 80 years..but recent work by some biophysicists and echinoderm colleagues have found crystals used as lenses in brittle stars! (here) and reported in Nature in 2001. Some paleontologists have argued these are present in Cretaceous sea stars. and just last year, microlens arrays were observed in the shallow, tropical species Archaster typicus.. 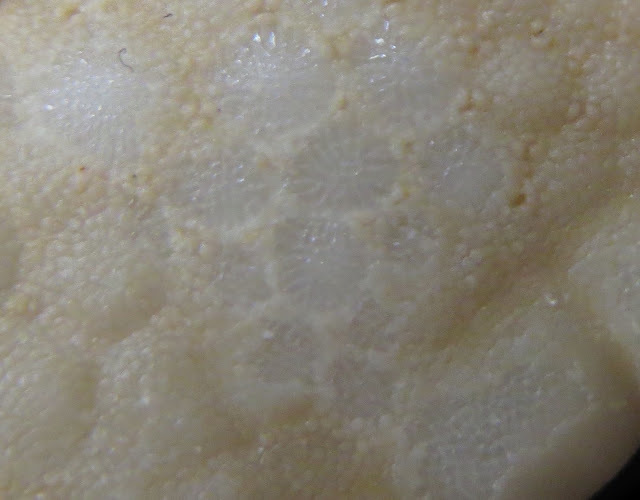 In this newly discovered genus and species from New Caledonia, Kanakaster solidus shows these crystalline bodies as a sort of pebbling all over the body surface, which is pretty suggestive of the microlens idea.. but I suppose they could also be incipient or underdeveloped granules which cover the body surface as almost a kind of thick tissue. Whereas, in this species, Kanakaster discus, the crystalline structures are actually arranged in stellate formations rather than simply as granulated pebbling. Much more suggestive of a "lens" type function I would think.. but hard to say without more data. If these ARE lenses? Why do the patterns differ? Some "lenses" are present in shallow-water species whereas others are present in deeper water species! And how are the patterns adaptive? If that's indeed the case? Many, MORE questions! and probably at least one more post about these newly discovered animals! Is there a way that I could contact you? 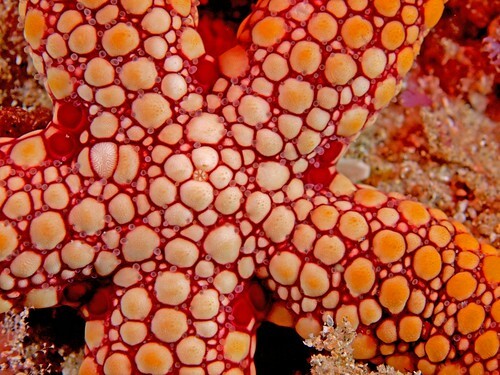 I'm working on a story featuring humans colonizing an alien planet, and the majority of animals on this planet are organized by radial symmetry, like echinoderms. I'd be interested to hear your thoughts on this idea, and run some of the creatures I've thought up past you to see how plausible they are. 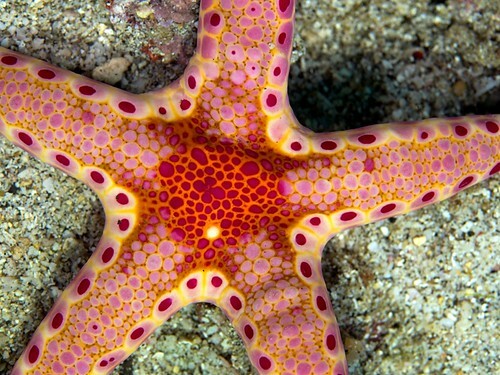 Also, what kind of changes would you expect with an echinoderm evolved to be a land animal? here is my "business" page..
Hey Professor, I saw some of these mysterious crystalline nodules in Narcissia too! When you remove the abactinal plates you can notice this structure under them. They are most noticeable on Florida specimens. I didn't know it was a taxonomic character, though. Thanks for sharing it with us!